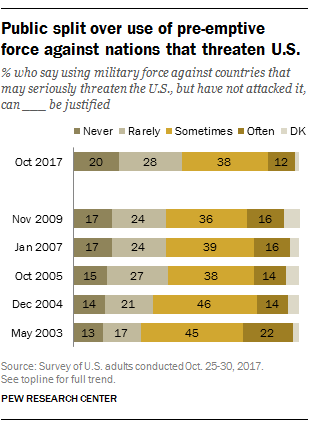 As rhetoric between the United States and North Korea has grown increasingly hostile in recent months, Americans are divided over the use of pre-emptive military force to attack countries that threaten the U.S.
Half say using military force against countries that may seriously threaten the U.S. – but have not attacked it – can often (12%) or sometimes (38%) be justified, according to a Pew Research Center survey conducted in October. About as many (48%) say such pre-emptive use of military force can rarely (28%) or never (20%) be justified. A recent report by the Center found that the share of Americans who see North Korea’s nuclear program as a major threat to the U.S. is as high as at any point since 2005. A separate report found that growing shares of Americans think the regime in Pyongyang is capable of hitting the U.S. with a nuclear missile and willing to follow through on threats to do so. Today, the public is somewhat more likely to express reservations about the use of pre-emptive force than it was eight years ago, when Pew Research Center last asked the question. In November 2009, during President Barack Obama’s first year in office and amid debate about drawing down U.S. troop levels in Iraq, 52% of Americans said the use of pre-emptive military force by the U.S. was sometimes or often justified, compared with 41% who said it was rarely or never justified (8% did not offer a view). The share who say pre-emptive military force is rarely or never justified is up 7 percentage points from 2009. In surveys dating back to the George W. Bush administration, public support for the use of pre-emptive military force was highest in May of 2003 – just weeks after the start of the Iraq War – when 67% said they considered it sometimes or often justified. Republicans and Democrats express starkly different viewpoints on the pre-emptive use of military force. Nearly seven-in-ten Republicans and Republican-leaning independents (68%) say the use of force against countries that may seriously threaten the U.S. but have not attacked it can often or sometimes be justified. Republicans are 6 points more likely to take this view than in 2009. However, the share of Republicans who back the pre-emptive use of force remains lower than at several points during the George W. Bush administration. For instance, in July 2004, 83% said the use of pre-emptive force was often or sometimes justified. Democrats are much more skeptical about the use of pre-emptive military force. Overall, 61% of Democrats and Democratic leaners say it can rarely or never be justified. The share of Democrats who say this is up 13 points from November 2009, during Obama’s first year. Democratic views fluctuated during the Bush administration. At the outset of the Iraq War in May 2003, most Democrats and Democratic leaners (57%) said pre-emptive military force could sometimes or often by justified. But toward the end of the Bush administration, Democratic views had flipped. In January 2007, 59% said pre-emptive military force could rarely or never be justified. There is a significant ideological divide on this question among Democrats. Three-quarters of liberal Democrats and Democratic leaners say the pre-emptive use of military force can rarely or never be justified. By contrast, conservative and moderate Democrats and Democratic leaners are more evenly divided: 52% say it can rarely or never be justified, while 46% say it can sometimes or often be justified. Among Republicans and Republican leaners, a somewhat larger majority of conservatives than moderates and liberals say pre-emptive military force can sometimes or often be justified (72% and 62%, respectively). There are modest differences on this question across many demographic groups, including age and gender. However, when it comes to levels of educational attainment, postgraduates express distinct views. Overall, 62% of postgraduates say that using military force against countries that may seriously threaten but have not attacked the U.S. can rarely or never be justified; fewer (37%) say it can sometimes or often be justified. By contrast, those with lower levels of education are more likely to say pre-emptive force can sometimes or often be justified: About half of those with a college degree or less education say this. Note: See full topline results and methodology here. Alec Tyson is a senior researcher focusing on U.S. politics and policy at Pew Research Center.